Have you ever wished you have a personalized journal to keep all your brilliant ideas? Somewhere beautiful to save all those inspirational photos, magazine snippets, color schemes and project plans? I’ve always wanted one and that’s why I worked with Jenn to create this Inspiration Blooms digital kit. I wanted something colorful and cheerful – a little art journalish, a little distressed – with a very flexible format. And of course it had to have flowers too! Jenn – from Joyful Heart Designs took some of my flower designs and created an amazing collection of papers, including some cool worn and shaped papers. All of the elements include Silhouette Print and Cut files (along with the usual PNGS) – so its super easy to cut out any journal piece you need. There are plenty of journal labels, tags and page tabs. There are also tabbed folders and of course flower elements. I’ve also included some digital brushes. Flowers (of course) but also some funky frames, word art and grungy corner stamps. Finally, as a bonus to the full kit, I’ve added some quick pages for your journal. Just add photos and notes – I even included one to track your favorite color combinations. Whew! That’s a lot of stuff! But I was having so much fun creating it that I just kept going LOL! You won’t believe the amazing projects the Digichick designers made with this kit! The journals and pages are jaw dropping. I’ll be sure to share them over the next few days! This entry was posted in Cutting Files, Digital Craft Kits, Digital Stamps and tagged DigiChick, Digital Stamps, silhouette on May 17, 2012 by Cathy. Hello everyone – Happy Spring Break. Well, its spring break here anyway. To celebrate, I thought I’d post a new Facebook Freebie. an 8 inch border strip with space to type in a sentiment. And – if you’d like to recreate my sample card, I included a Silhouette Print and Cut file for all the pieces of the card front. You can download the kit on our Facebook page right here. 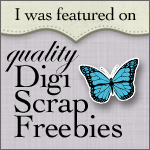 Just click on the Freebies for Fans tab and “like” us if you haven’t already. I hope you enjoy it and I’d love to see what you make – so drop me a note so I can check it out. In other news – I’ve started re-stocking the Paper Garden Projects Store. I was actually thinking I was going to trim it way back, or maybe close it because of the time and energy it takes away form other pursuits. But… I started to miss it. So… I think I’m going to stock up again on the things I really-really love. It would be delightful if you’d leave comments on paper craft products you really love – so I can check them out and maybe carry those too. The new Copic Marker colors are in and they are 25% off. I’ve also restocked all the adhesive gem stones and pearls that were sold out (love those). I’ve also restocked the X-Press blending card cardstock for Copic coloring. “Hop” on over when you get a chance . This entry was posted in Cutting Files, Digital Stamps on April 1, 2012 by Cathy. DH’s Birthday is on Monday – so I need to get busy and make a card. While my DH is indeed quite a catch, I’m not sure this is the right card for him or not. Baseball is not really his sport. But, I still have a few days to see if anything else comes up. I used the Get it in Gear cutting files and the Daddy day Digital stamps. The papers are from my Owl Wear Woolies digital kit. So I really can claim I made the card all by myself! W 0, 1, 3 for shadows and a little YG-91 at the base. The weather here has been amazing – almost too hot. So much is blooming already! So I’ve been out ion the garden a lot. Hopefully we will get some rain soon. We need it, and its the perfect excuse to spend time designing new stuff. This entry was posted in Cutting Files, Digital Stamps on March 21, 2012 by Cathy.